Hello Gamers!!! Here's a Special Treat for you!!! Today, I thought that we would review a classic game for all you Star Wars enthusiasts. I know you're out there....(Insert Star Wars opening theme song here). The now defunct and defamed studio, Lucasarts has been known to create wonderful games over the last few years. They stretch from not just the Star Wars games, but also games like the Secret of Monkey Island and Day of the Tentacle. These classics define the best of what Lucasarts created, before they shut down. Thanks Disney!! 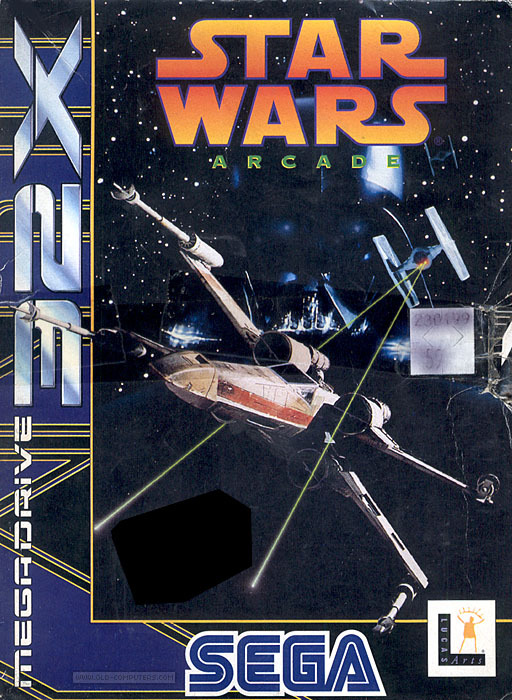 One of the lesser known, but still excellent game, created by Lucasarts and published by Sega, is the Star Wars arcade game for the Sega 32X, released in 1994. The game puts the player into the cockpit of an X-Wing to relive some of the space battles from the first film. There are 5-6 levels of shooting down Tie Fighters and skimming the trench to destroy the Death Star. Of course, there is also the typical and great John Williams digitized soundtrack that suits the game well. The graphics are not too bad for the time, I was impressed when I first saw them in 1995. The game plays very well. The pilot is offered either a first or third person view to shoot down Tie Fighters. There are also options for two player action with one pilot and one gunner. This is very fun for those who enjoy co-op gameplay. Another nice feature is the inclusion of the 32X mode, which offers an extra level to play above and beyond the arcade level. The only anachronism is the inclusion of Admiral Ackbar as your commander and person who leads the player into battle. He didn't show up until Episode VI!! There are nice FMV (Full Motion Video) scenes placed throughout the game to help tie the movie into the game, a nice touch to complete the package. I know that many poo-poo the 32X, but this game definitely shines through as easily one of the best for this add-on. It really shows what the 32X is, or rather was, capable of, and it delivers in the fun department, the most important. This is a wonderful and fun game. Any Star Wars fan, or non-fan, should enjoy this space shooter. It plays very well and offers a great amount of challenge for any would-be rebel pilot. We give this game a 9/10 Rockin' Stars!!! Now, get to gaming!! Tell us what your favorite old school game is in the comments below. Hello Gamers!!! I hope everyone is doing well!!! Gaming Queen here, and I have decided to review an AWESOME PS2 game!!! It's truly one of my all time favorites. I have so many all time favorites. Today's review is going to be one of the GREATEST Action RPGs ever!!! Any guesses? No? Alright, I'll tell you. Kingdom Hearts by Disney Interactive and Square. It was released in March of 2002. Kingdom Hearts takes two of my favorite things and combines them together to get one helluva great game! 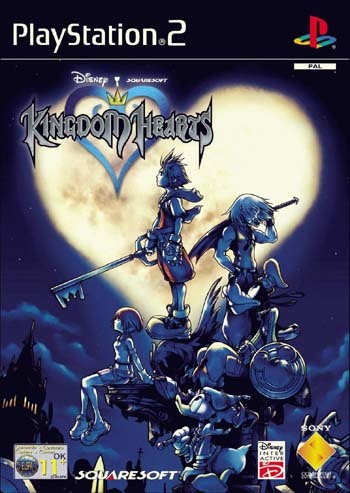 Since it is a long game, with a lot to cover, this will be a Kingdom Hearts Series of reviews. So enjoy part one!!! Final Fantasy+The Disney World=AWESOMENESS!!! Looky there, we did some math! I remember my first encounter with Kingdom Hearts. I was watching the Disney Channel and happened to see an amazing behind the scenes making of Kingdom Hearts. I saw the familiar faces of certain Final Fantasy VII (FFVII) faces and several familiar Disney faces in various Disney worlds. I was immediately intrigued. I watched as the game developers brought to life many great Disney films from my youth and placed them into a video game. I knew that I had to have it! I couldn't wait for the release! When the day finally arrived, I went to the local store and bought it. I couldn't wait to get home to play it. I felt like a little girl that was visiting Disneyland for the first time. Ah, memories! What separates this game from other Disney video games is that A) It's gorgeous. B) It's not your typical Disney game. (Think SNES/PSone era platformers). C) The soundtrack is beautiful. D) The graphics are phenomenal. They really harnessed the power of the PS2 and showed what a powerful console it was and continues to be. E) Sephiroth! Maleficent! Hades! Cloud! Squall! The Queen of Hearts! Need I say more? I could, but Sephiroth! Maleficent! Both in the same game? Yes please! Kingdom Hearts is the very first Action RPG that I played. I love the fact that it is not a typical turn-based fighting RPG. Players can run up on enemies and fight them, without having to set up the fight, like a typical Square RPG. There is magic and other goodies, but I will get to that. Players start off with a tutorial to familiarize themselves with the games controls. Next, players have to make a couple of decisions before they advance to the first world Destiny Islands. The choices the players make in the beginning do have an impact on the gameplay, and the choices cannot be altered later on in the game, so my advice, choose wisely! After the tutorial, as mentioned, players are put on Destiny Island. Here, there are a couple more decisions players make, but they determine the speed at which your character learns magic, and the speed of the game. After the choices are made, the story unfolds. 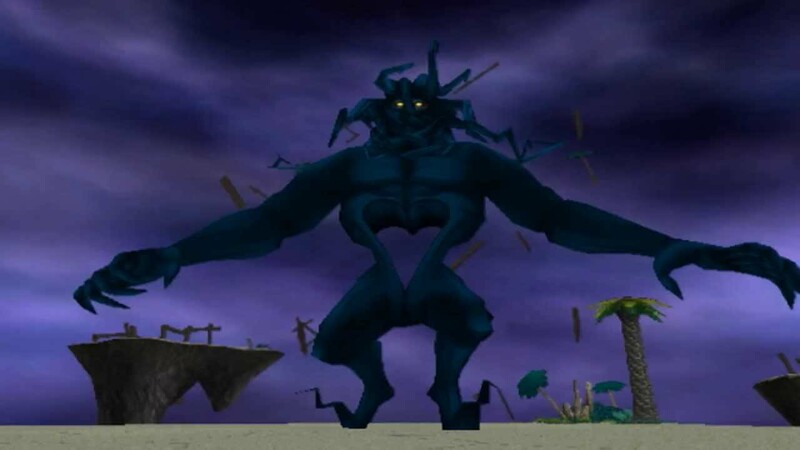 You play as a young boy named Sora, voiced by Haley Joel Osment, you know, the kid that sees dead people? Him! He is on this island with his friends Riku and Kairi. A couple of other FF characters are there too, but I'll leave that as a surprise. The three friends want to leave the island because they know there are more worlds out there, there has to be, right? They are preparing for their trip, so Sora has to collect items that are randomly placed throughout the island. He does that for a couple of days. On the night before the trio plans to leave, there is a storm that brings about darkness and heartless. Oh, and a magical Keyblade falls mysteriously into hands. Eventually, Sora makes his way to an already familiar hole in a tree, and the story really unfolds. Sora is whisked away to Traverse Town and separated from Riku and Kairi. In Traverse Town, Donald Duck and Goofy are looking for the bearer of the Keyblade. Anywhoo, they eventually meet up, and the power of the Keyblade is explained to Sora. After Donald, Goofy, and Sora agree to team up, they head to their Gummi Ship and embark onto new worlds. (I couldn't help but have the song "A Whole New World" pop into my head just now). Speaking of Gummi Ships, they are awesome! Chip and Dale, the little chipmunks, handle all things Gummi. But players fly through little worlds shooting at flying enemies and collect pieces to upgrade the Gummi Ship with. The little flying world eventually stops at the major worlds where players exit the Gummi Ship and continue with the story. *A word of advice, make sure, when you upgrade your Gummi Ship, you put the guns facing the right way, otherwise you won't be able to shoot forward, only backwards. That makes it difficult to navigate through the world. Learn from my mistake!!! There are several Disney worlds to choose from. Here are a few worlds that are included in this masterpiece of a game: Wonderland (Alice in Wonderland), Atlantis (The Little Mermaid), Neverland (Peter Pan), Hallow Bastion (Beauty and the Beast), Hundred Acre Wood (Winnie the Pooh), Agrabah (Aladdin), and Monstro (Pinocchio). There are others, but I don't want to give them all away. I shall stop here Gamers! There is more to come on this phenomenal game next week!!! Stay Tuned!!! And as always, GET TO GAMING!!! Hello Gamers!!! Gaming Queen here, and I have a treat for you. Today, I will be reviewing a NeoGeo AES game. Yes, the NeoGeo console is amazing! If you have never played one, I highly recommend that you try and get your gaming hands on one! If you can't afford one, there are plenty of emulators, which are free, and a large amount of games to play. Over Top: Developed by ADK and Published by ADK, SNK. 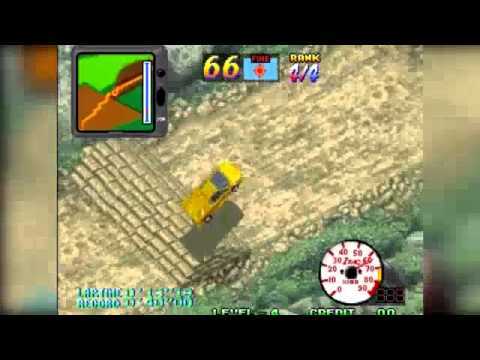 Over Top is a top view racing game. The graphics are pretty rad, considering it was released in 1996. 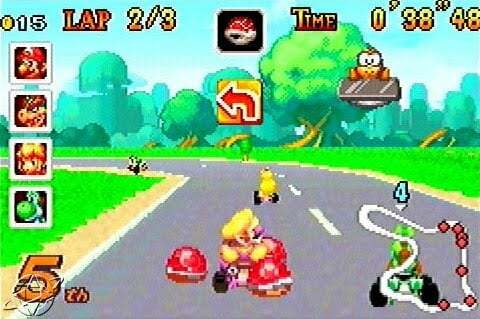 The point of the game is to beat the clock to reach checkpoints so that you can continue racing. First you make your way through the city, then into the woods, then mountains, then through a desert, and then the finish line, which is back in the city. Racers can pick from several different types of vehicles, from big jeeps to sport cars, and everything in between. It's easy to fall into last place because sometimes the vehicle gets stuck grinding on some of the scenery. I couldn't tell that the scenery was capable of such bothersome annoyance. It seems pretty flat. Sadly, I fell victim to that several times, but it was still fun to play. There is an arrow that pops up to let you know when there is a turn coming up, and how the turn is. Some of the turns are simple, while others can be a bit complex to work as you race at top speeds. That's when the grinding against the scenery comes into play. You can also flip over is the turn isn't handled properly. 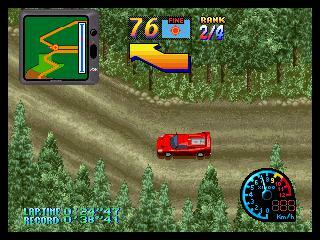 After the racer makes it to a checkpoint, time is added to the time that was depleted, while racing, and the car is controlled by the game for a few seconds as it makes it way to the next course. There are also obstacles to jump over, especially in the desert course. Sadly, I have not finished a full race, so I personally cannot say how many races there are. But, the games is fun and frustrating, everything that a RetroGame needs to have! The music is generic, as are sound effects, but those are pretty minor complaints from my perspective. I typically listen to other music when I get into hard-core gaming sessions. This would be a hell of a party game for those that like to play with friends. Overall: Great game, pretty good controls, awesome graphics, and generic music and sound effects. I give this game a ROCKIN' 8/10 stars!!! Now, Get to Gaming!!!! By order of the QUEEN! Happy New Year Gamers!!! I hope that everyone had a wonderful Holiday season. The Gaming QUEEN is back!!! I am sorry that I have been on hiatus, but school and other things that pop up have to be handled. First thing is first, I have a confession to make. It's kind of a horrible thing to admit, but I for one, am not a fan of the newest consoles on the market. 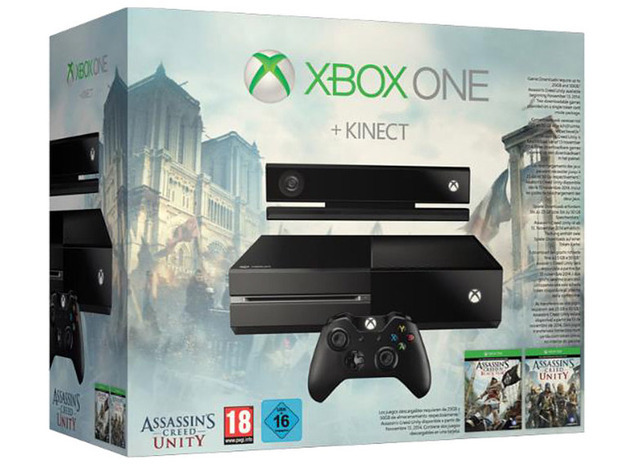 Yes, I've had a PS4 and an Xbox One, but I did not enjoy them. Before you shred me, I will admit that the graphics for the games are amazing, but the new method of having to install every single game on the console is not something that I want to do. Not to mention, for me, the games are focused more on online gaming, and I personally, never have good experiences when I play online. Also, the actual games are a problem for me. Where are the days when developers made good games from the start? Nowadays, I have to wait for a patch or DLC, not to mention having to install updates constantly. That really takes the fun out of gaming. Another complaint is that I already spent $60 on a game, now I have to shell out more because the developers didn't add the content the first time around? And if I want the best of the best (in game content), I have to shell out more money? Gaming isn't what it used to be, that's for sure. I have finally reverted to seventh generation consoles, and of course, anything before seventh gen. With all that said, I will be reviewing the oldies but goodies, or in my opinion, the besties. There are tons of games on the older consoles that are wonderful and need to be promoted. Next, I would like to say that I am going to post more, at least weekly. Once I get more time, I will do more. I am going to shoot for Thursdays because those are TBT's, and the games I will be reviewing are throw backs. I will try and do more, but I am coming up on my last couple of semesters at my current school, and I am getting ready to transfer to the University that I have had my eyes set on for the past few years. I would also like to do reviews on board games more often too, so be on the lookout for new content and new games. As always, GET TO GAMING!!! Hello Gamers!! I hope everyone is leveling up!!! I thought I would try something new here at Games That Rock! I don't know about you guys, but I love finding new games to play. There have been some awesome games in the making over at Kickstarter.com, so I thought that it would be pretty cool to start sharing some of them here. I found one tonight that looks totally awesome!!! I am definitely going to be picking up a copy of this badazz game. The above is a link that will explain the whole concept of the game. There is also an awesome video that goes along with it. The company, located in Poland, has reached it's goal, so I am hoping that we will be able to start purchasing this badazz game soon! Here is an image from Kickstarter Lobotomy game. It looks pretty awesome. The gameboard connects together, so it can be easily stored and rearranged. There are several miniatures and mental disorder cards to go 'round. Let me know what you think? Can you escape the asylum, or will you get a lobotomy??? Please let me know what you think about the new segment!! !